We are a leading Manufacturer of ms ptfe lined elbow, cs ptfe lined elbow, stainless steel ptfe lined elbow, ms pp lined elbow, carbon steel lined elbow and ms hdpe lined elbow from Vasai, India. 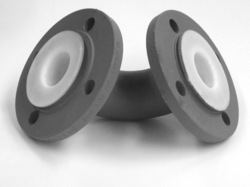 We are the leading manufacturer and exporter of a wide range of MS PTFE Lined Elbow. The offered lined elbows are perfectly engineered by our competent worker’s team consuming the finest material and updated tools in accordance with set market norms. Our quality specialist examines this lined elbow on several provisions of quality. We offer these lined elbows in different sizes as per the stipulations laid down by our customers. By keeping track with the current market development, we are involved in offering optimum quality CS PTFE Lined Elbow. With the support of our experts, we manufacture this CS elbow utilizing quality assured material and updated technology in compliance with the set industrial norms. In addition to this, the CS elbow is inspected through stringent quality tests by our specialist. With the help of our skilled professionals, we are capable of offering a wide array of CSPTFE Lined Elbows. We use the best grade material to manufacture the lined elbows. Our quality experts perform a test on this lined elbow to make assure about its quality. We are recognized as the prominent manufacturer of a wide collection of Stainless Steel PTFE Lined Elbow. The offered lined elbows are examined by our quality experts in order to deliver a defect free range. Our team of proficient professionals uses advance technology to process these lined elbows to meet the universal accepted standards. We are offering these lined elbows in different stipulation & customization as per the request of our customers. 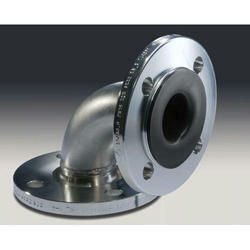 Flange IS 2062, in compliance with ANSI B16.5/class 150lbs; JIS 10K or DIN is also available on request. 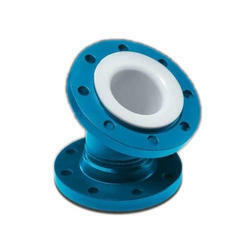 Standard: Two fixed flanges two loose flanges or one loose and one fixed flange are on request. Ductile iron ASTM A395 and ASTM A234 Gr. WPB are both available. We are recognized as one of the prominent manufacturers and exporters of MS PP Lined Elbow. We are presenting a wide range of Carbon Steel Lined Elbow which is developed from the premium raw material. Our lined elbows are readily presented in different specifications as per the varied demands of the patrons. Easy to install, these dimensionally precise products are offered to clients at industry leading rates. 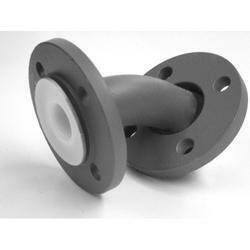 We are the leading manufacturer of MS HDPE Lined Elbow. 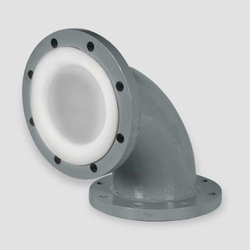 We are recognized as one of the prominent manufacturers of SS HDPE Lined Elbow.